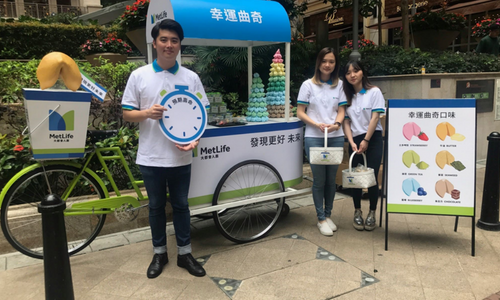 MetLife Hong Kong launched a recruitment campaign, MetLife’s new diagnostic tool ‘MetLife Discovery’ endears the brand with job seekers across Hong Kong. MetLife’s new tool ‘MetLife Discovery’ leverages a rich body of data to help agents design bespoke insurance packages with just a few simple clicks – equipping them with knowledge, objectivity and efficiency, as well as a meaningful career making a positive difference to their customers’ lives. At the heart of a campaign is a humorous film featuring a young man seeking his true career calling from a host of fortune tellers, only for him to find it at a MetLife Discovery talk. The campaign is running across social and digital platforms including Facebook and Youtube. It is also supported by print and interesting on ground activation events – “MetLife Fortune Cookie Trike”. A simplified version of MetLife Discovery is available for young talents and consumers. “We wanted to show talent across Hong Kong that MetLife is serious about providing them with successful careers, and that as an organization we understand what tools they need to succeed.” Says Lee Wood, CEO of MetLife Hong Kong.